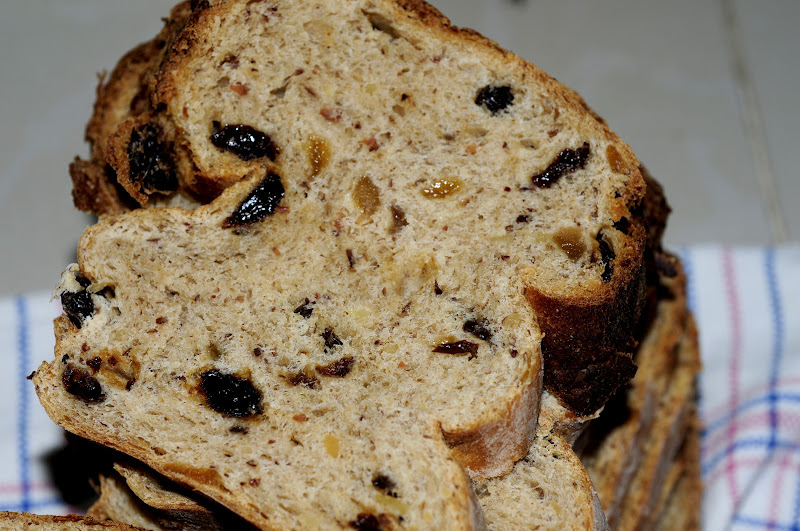 There was no raisin bread left in our freezer and we like to eat it all year round. We don’t wait until Easter or any other special festive day. In the Netherlands you can buy “krentenbollen” or raisin buns or hot cross buns everywhere. Off course the best ones you buy at the artisan bakery shops or bake them yourself with this recipe. 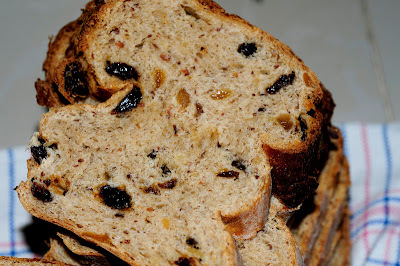 Instead of buns I wanted to bake a loaf of raisin bread and I had some dried mango in the pantry. I bought these because I haven’t tried to dry mango from our own mangos. Our garden is full of mango-trees. Because we don’t use any chemicals in our garden we have a lot of bugs. Some lay their eggs in the mango flowers and when the fruit is formed their larva have enough to eat. Other bugs just eat the ripe mangos hanging on the trees. Our neighbors spray a few times against bugs. There are a lot of bugs eating the mangos and the mangos are a big part of their income. So the remaining bugs in the area come to our garden. We don’t mind because we love bugs, butterflies, birds and all the rest. We don’t sell our mangos and like to give them to our friends. They all know about the bugs and they don’t care. We also have friends who take care of 25 macaque monkeys. The monkeys love mangos and maybe especially the ones with some extra bug-protein. As soon as I succeed to make my own dried mango I’ll post about it. I wanted to use my sourdough along with yeast from the sponge. I made starter with 25% rye, which is really good in a loaf of bread. And, it’s also nice in Raisin Bread with Mango. Peter likes the version without the rye better. The bread has a light brown color because I added the raisin too soon and they were in the mixer for at least 6 minutes. Some of the raisins were torn up and this gave the dough its color. 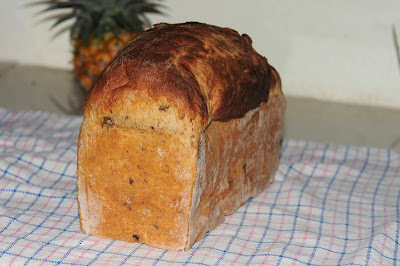 Here you find my version of a sourdough loaf of “hot cross buns”. The original recipe of hot cross buns with sourdough you find at Sue’s You can do it at home. It's adapted from Jeffrey Hamelman’s Bread: a baker’s book of techniques and recipes. First make the sponge. Mix yeast into the milk, add flour and sugar and mix until thoroughly incorporated and smooth. Cover with plastic wrap or plastic bag and leave at room temperature for 30-40 minutes. The sponge will grow about 3-4 times of its original height. Mix soft butter with the flours until roughly combined. Add eggs, sugar and salt and mix until it comes together. Add the sponge and starter and mix until the dough ball is formed. Knead until medium gluten development is achieved (that the dough can be gently stretched into a thin sheet without tearing). It would take approximately 6 minutes on second speed if using mixer. Add the raisins and Mango peels and mix until these are evenly distributed throughout the dough. Place the dough in a slightly oiled container, cover and leave for bulk fermentation for 1 hour – 1.5 hour, with a light fold after 30 minutes. Pre shape the dough in a lightly ball and leave for 15 minutes to rest. Grease the bread pan with a little butter and dust with flour. Then shape into a firm batard to fit your bread pan. Place the dough in the bread pan, cover and leave to proof for about 1 hour. Check with your finger, when the indent of your finger comes back quickly it’s not proofed enough. When the indent of your finger comes back very slowly it’s time to bake the bread. In the mean time pre heat the oven at 220°C. I baked the loaf for 30 minutes. Smear with butter and enjoy this moment. How wonderful would it be to have a mango tree in your yard!? (SO WONDERFUL) I like that you give all the critters sanctuary...I think I would be the same way. Though I would begrudge having to share my mangoes...just a little bit ;). I can't wait to see a post on drying your own mango (that is one of my favorite treats in the world). But this bread sounds and looks amazing...so tall and mighty! Hi Heather, it's wonderful to have so many trees. But when I picked the last one, for a moment, I was happy we had a small harvest this year. It’s hard work to pick mangoes balancing a long pole in the air. With more than 15 mango trees we can harvest hundreds of kilos. Next year you are welcome to pick as much as you can. This looks like a delicious loaf! I bet having mango trees in your yard is so fun! Adding them to the bread is a great idea!! Thanks Gingered Wisk, it is fun having mango trees in our garden and delicious in bread.